In a fit of optimism, I planted some courgette seeds and put them on the propagator. Arthur has mixed feelings about this: on the one hand there is a lot less room for Arthur now, but on the other hand the propagator is actually on, so it is warm and cosy. There is even a comfy towel on the end of it not occupied by plants, placed there to keep the heat in, Of course the heat is kept in far more efficiently by the towel AND Arthur combined, so he is, in effect, keeping the courgette seeds warm. (and guarding them, naturally). The slightly disjointed appearance of this drawing is because I tried sketching Arthur first, and then putting the background round him: not an ideal way to create a drawing but he had moved twice before I got his outline in and I couldn’t guarantee he would be there at all if I did it the other way round. Urgent cat business and all that…. On the whole, simpler subjects are probably better when sketching cats! 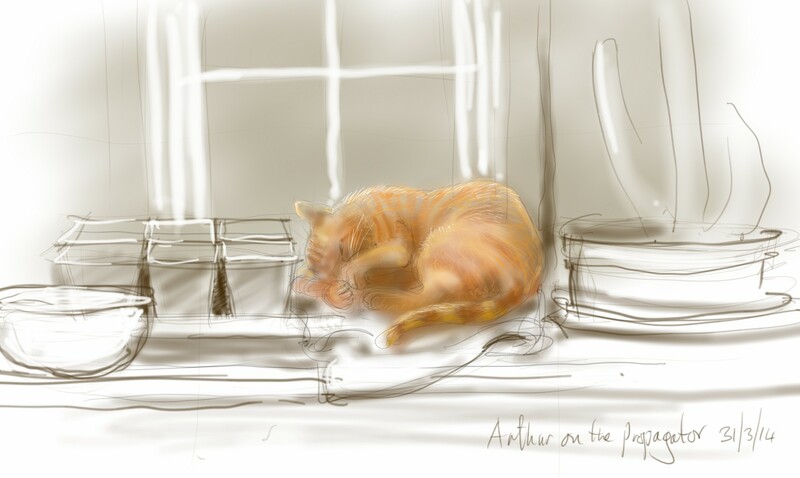 This entry was posted in Cats and tagged art, arthur cat, cat, cat sleeping, cat-of-the-day, digital sketch, drawing, illustration, samsung galaxy note 3, tablet sketch on March 31, 2014 by Nancy Farmer.